Estadio La Rosaleda is the home football stadium of La Liga club Málaga CF with a capacity of approximately 30,000. The original incarnation of the stadium opened in 1941, but the ground has since undergone three major renovations in 1982, 2000 and most recently in 2010. Although the first match was held on the 3rd of April 1941 the inaugural match between Malacitano (Old name of Málaga) and Ferroviaria should have occurred much sooner, but didn’t due to the outbreak of the Spanish Civil War delaying the project time by over 5 years. 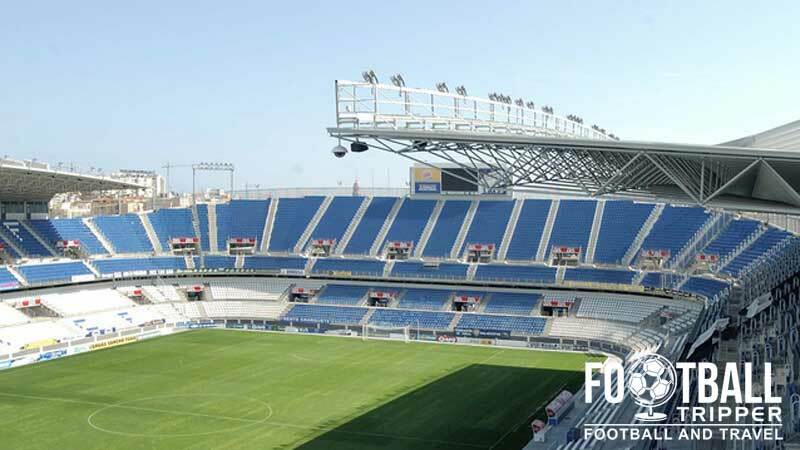 Curiously, some regard the official opening date as the 14th of September whereby the 8,000 capacity stadium hosted a match against Sevilla in the league. 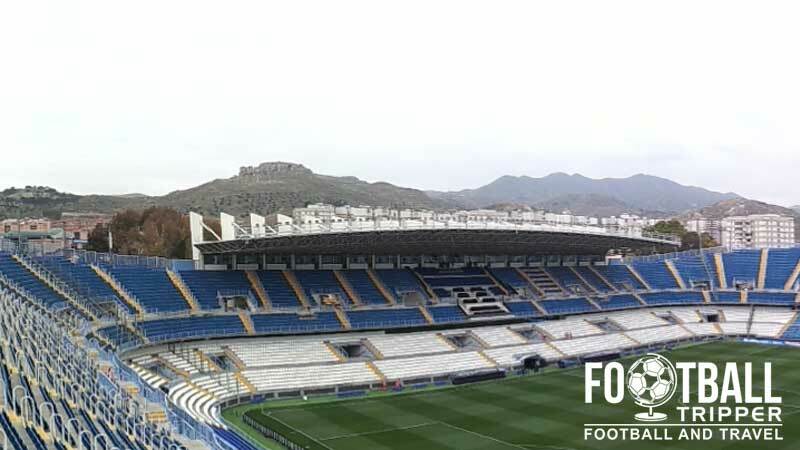 As football fever began to grip Europe and Spain, La Rosaleda was eventually expanded to a capacity of 22,000 with the addition of a new two-tiered east stand laying down the gauntlet for future renovations. The 1982 World Cup finished what the expansion of the 1960s started with further tiers added onto the remaining single-tiered stands in addition to the pitch being lower and improvements to the exterior. During the World Cup itself, the then 37,000 seater La Rosaleda Estadio hosted three group matches: Scotland vs New Zealand (5-2), Soviet Union vs New Zealand (3-0) and Soviet Union vs Scotland (2-2). The stadium remained unchanged for the next two decades with the next modernisation steps occurring in the year 2000. Over the next 6 years, La Rosaleda (The Rose Garden) once again blossomed into beautiful flower thanks to the combined efforts of architect José Segui Pérez and Sando-Vera who turned it into a bouquet of modern, commercially viable, safety-regulatory meeting, corporate facilities. La Rosaleda is comprised of four sections: Fondo North, Preferencia (East), Gol (South) and Tribune (West). Away fans are usually housed within the upper tier of the south-west corner in an area separated from the home supporters via a section of steel fencing. Uncovered to take full advantage of the enviable climate, views from this part of the ground are decent although the size of the area appears to be quite small compared to the away allocations of other European grounds. As a famous and widely popular tourist destination there is plenty of entertainment on offer within the city centre and around La Rosaleda itself. The map below outlines some of the more popular sports bars, but just by walking around you’re more than likely to unearth your own gems. Estadio La Rosaleda is located in an average area with a combination of residential and commercial property nearby. Restaurants include Los Robles de Leon, Restaurante le Casa Mata and La Taberna de Juan with there being a whole bunch of options within the nearby shopping centre, Centro Comercial Rosaleda. There are 4 Malaga shops in total addition to the online store. The most popular of course is located at Estadio La Rosaleda along Esquina Av. The exterior of the club shop which is built within the structure of the stands. There are also shops within Vialia Shopping Centre, and on Avda. de le Aurora. Los Boquerones offer fans the chance to embark on a 45-60 minute fully guided tour of La Rosaleda which includes restricted areas such as the players’ dressing rooms, and the pitch itself. Afterwards the tour takes you to Museo Málaga CF which is a dedication to the history of the club and its numerous artefacts. 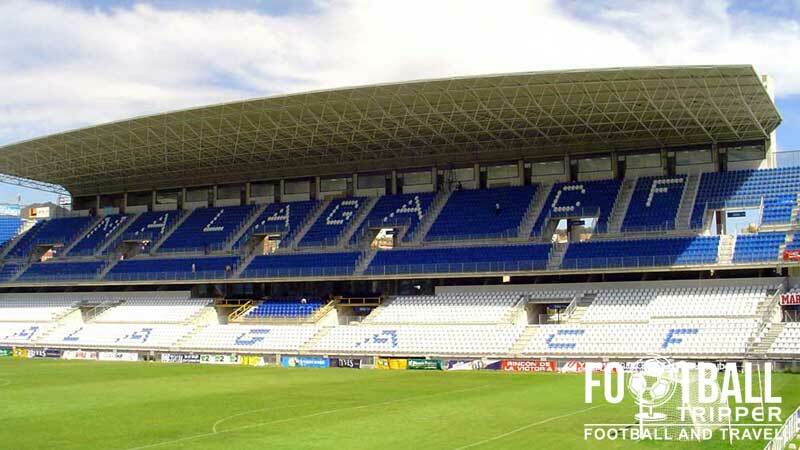 Tickets for Málaga matches are usually either purchased Online or at Taquillas (Ticket windows) outside the stadium in the days leading up to and on the day of the match. 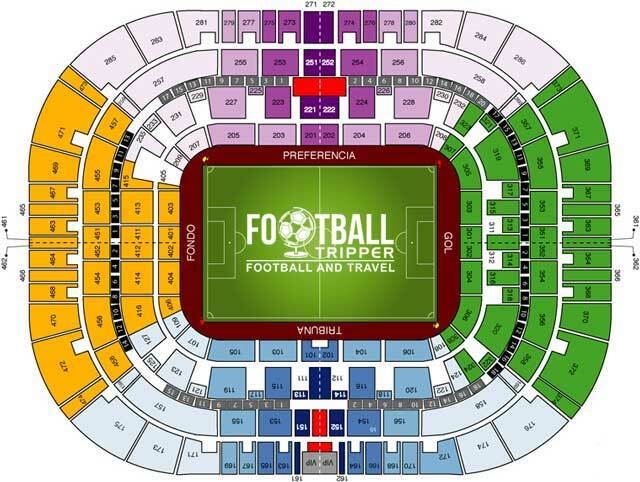 Price wise expect to pay anywhere between €20 for a bog standard seat behind the goals to €75.00 for a central seat near to the touchline. Of course, expect to pay a premium when the big boys such as Barca and Madrid come to town. Further questions? Phone the Ticketing Department on +34 902 07 09 12 or send them an email [email protected] Enjoy the game! La Rosaleda stadium is located approximately 3km inland from Alboran Sea towards the North of the city on the left bank of the Rio Guadalmedina river. A look at Estadio La Rosaleda from the outside. Perfect weather for a photo. It will likely take you around 30 minutes by foot from the city centre. If you are driving from South West then you will be traveling on the A7 motorway meaning you will have to take Exit 240, and then follow signs to the stadium after taking the first exit at the first roundabout and second exit at the second roundabout. There doesn’t appear to be any official carparking available at the stadium which means you will have to improvise if driving. This Parkopedia page contains an excellent map of available parking spaces and their costs within Malaga. Malaga’s main train station Maria Zambrano is a similar distance away by foot but is on the left hand side of the river which means you would need to take a different and far less scenic route. The train station mainly serves other destinations in Spain such as Madrid (2.5 – 3 hours), Cordoba (1 hour) and Seville (2 hours) with commuter rail lines being of no assistance in getting to La Rosaleda. As there isn’t a bus station immediately outside the station, the best advice would be to walk east across the river to Alameda Principal in the city centre where buses do depart from. The city’s main station is named after Maria Zambrano who was a famous 20th century Essayist and Philosopher. Bus 17 – Heading to La Palma. Get off at the Avda. Dr. Marañón stop. Bus 26 – Heading to Alegría de la Huerta. Get off at the Rosario Pino stop. Bus 2 – Heading to Ciudad Jardín), Get off at the Jorge Silvela stop. Málaga Airport officialy known as Málaga–Costa del Sol Airport is the 4th busiest airport in Spain and is the major airport for the Costa Del Sol. 8 km Southwest of the city centre. The airport now has a transportation hub outside of the newly built Terminal 3 meaning that you can easily transfer to the city centre either via Bus or metro/train line very conveniently. The underground station opened in 2010 and services run to the city every 20 minutes or so taking 12 minutes, with the buses slightly more frequent in number, but with the trade off of journey time (30 mins). Lastly, Taxis from the airport will set you back a minimum of €20 due to how they price journeys in the area, with both the bus and train service costing you no more than €3 for a single fare. 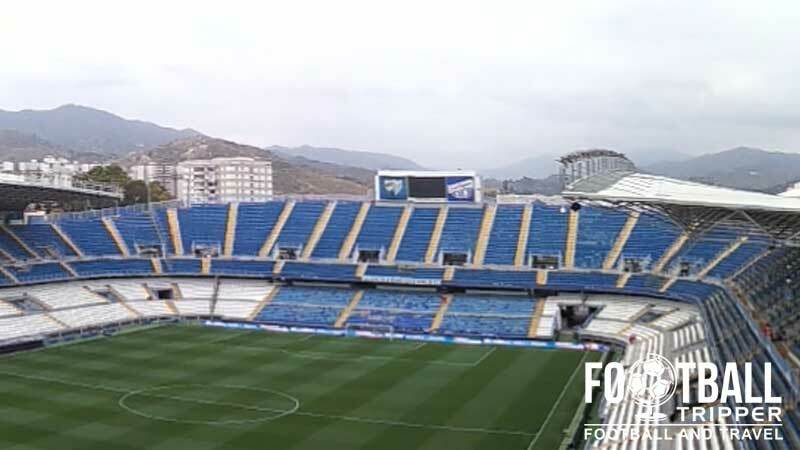 There really isn’t anything nearby to Malaga’s football stadium meaning you’re not going to be able to see the game and then literally crash out asleep 5-10 minutes later. Still as a tourist, this is probably for the best as the short 20 minute stroll southwards will not only ensure that you take in more sights. Hotels which look alright include Salles Hotel Malaga Centro, AC Hotel Malaga Palacio by Marriott (Bit of a mouthful) and Hotel Del Pintor, but please don’t take my word for it and do your own research.